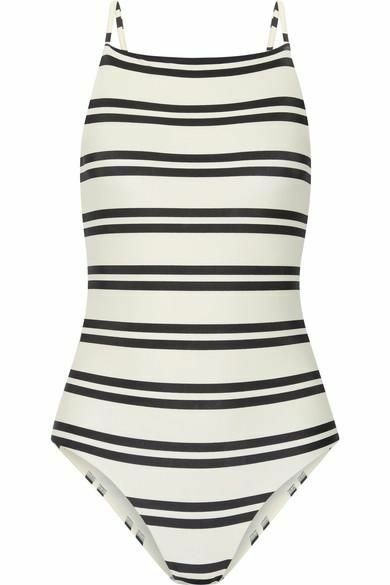 If you're in search of a swimsuit that is both timeless and trendy, consider investing in a striped version. The classic pattern is universally flattering and will still be cool and wearable season after season because, well, stripes (whether they run horizontally, vertically, or diagonally) will never go out of style. Thus, we highly recommend investing in at least one (if not two or three) striped swimsuits because you will be wearing them forever. Ahead we've searched the internet to pull together a great selection of lined bikinis and one-pieces that are chic, timeless, and fashion-forward. From a classic one-shoulder style to another featuring cool buckle straps, these are the striped swimsuits we guarantee you'll live in this summer—and next. Next up, shop the best sandals to wear all summer long.